Chief Justice G. Rohini was sworn in as Chief Justice of High Court of Delhi on April 21, 2014. 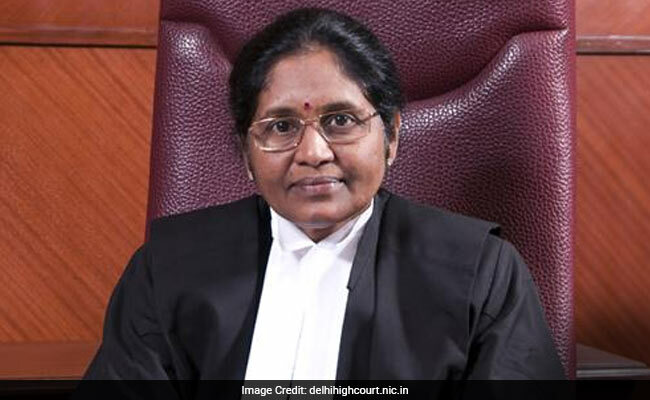 New Delhi: As the first lady Chief Justice of Delhi High Court G. Rohini retired from her post on Thursday, the court now will be headed by another lady judge Justice Gita Mittal, the second senior-most judge of the high court. Chief Justice G. Rohini was appointed as Additional Judge of the High Court of Andhra Pradesh in 2001 and as a Permanent Judge the next year. She was sworn in as Chief Justice of High Court of Delhi on April 21, 2014. At her farewell function, Chief Justice Rohini shared her experiences of working in Delhi High Court and expressed her gratitude to family and staff. "It's my great fortune that I became the Chief Justice of Delhi High Court which has carved out a special position for itself not only in India but also internationally. It's a matter of great pride for me to become the first woman Chief Justice of this prestigious court." She also said that she "always focused on rendering quality judgements rather than quantity". During her stint as Chief Justice of Delhi High Court for three years, she passed numerous landmark judgements, such as ruling that the Lieutenant Governor is Delhi's administrative head and isn't bound by the advice of the city council of ministers. Born in 1955, Justice Rohini studied at Osmania University in Hyderabad and then at the College of Law, Andhra University in Visakhapatnam. Justice Gita Mittal will assume charge as Acting Chief Justice of the high court from April 14. Justice Mittal, an alumna of Lady Shri Ram College for Women, was appointed as an Additional Judge of Delhi High Court in 2004. Prior to her appointment as Additional Judge, she had an illustrious legal practice in many courts and other judicial forums since 1981. Justice Mittal is presently chairing the court committees on the Delhi High Court's Mediation and Conciliation Centre as well as the committee monitoring the Implementation of Judicial Guidelines for Dealing with Cases of Sexual Offences and Child Witnesses. She has spearheaded the Vulnerable Witness Court Project in the trial courts in Delhi leading to the first such court room in India being inaugurated on 16th September, 2012 and the second on 11th September, 2013. Her judicial pronouncements include judgements on compensation for riot victims, right to shelter of internally displaced persons, right to marriage of a lady member of the Armed Force, the appointment of a person suffering from 'Disorder of Sexual Differentiation' into the para-military force, public interest, communication and commercial disputes of a wide nature.